Discussion in 'Acquistion Targets' started by zuolun, Apr 6, 2013. Nikkei closed at 13,589.03 (-737.43, -5.15%) on 30 May 2013. High of 14,098.16, low of 13,555.66. SO THE VERSION of events being touted by Japan bulls is that last week's one-day 7.3% plunge in the Nikkei represented simply a pullback for a market that had put in its most supercharged performance over six months since 1953. This presents a major buying opportunity for those who believe "Abenomics" and the newly pugilistic Bank of Japan will drag Japan out of its two lost decades - or so the story goes. But was Thursday's stock market collapse about equities or really all about bonds? I suspect the latter, as the equity meltdown unfolded after a capitulation in Japanese government bonds that saw yields spike to their highest in a year. Bank of Japan governor Kuroda spoke on Friday about calming bond markets, but ever since he announced the mammoth quantitative easing programme in April the JGB market has turned into a quivering mass of uncertainty bordering on terror. It might just be that now the easy money has been made by punting on Japanese equities, a slower grind higher is on the cards after last week's "correction". But I'm not convinced it was simply a correction. Rather, it might have been something closer to a realisation that for all the brouhaha of Abenomics, the "three arrows" and the shed-loads of money printing, the Japanese financial authorities are losing the plot. HEDGE FUND MANAGER Kyle Bass, whose Hayman Capital fund has returned 25% a year since 2006 and who correctly bet against US mortgage-backed securities, reckons a full-blown Japanese financial crisis is around the corner. And that's because the old status quo of household saving, current account surpluses and low fiscal deficits has been chucked out of the window. There are more spenders than savers in Japan, and the country is close to facing a current account deficit as well as running a budget deficit of more than 10% of GDP. Meanwhile, Japan's public debt to GDP is approaching 230%, the highest percentage of any nation in the world, with the debt largely funded domestically. A Tokyo-based Japan funding head for a European bank told me last week that bank investors in JGBs had been "shell-shocked" by the recent capital losses they had sustained on their JGB portfolios, and were panicking about how to protect themselves against further losses. That wasn't the Kuroda script at all - monthly purchases of JGBs were supposed to pull yields down. But then there's the Alice in Wonderland absurdity of announcing a 2% inflation target as an explicit policy goal and not expecting that nominal yields will have to rise in anticipation of higher real yields in the future, assuming the target is achieved. 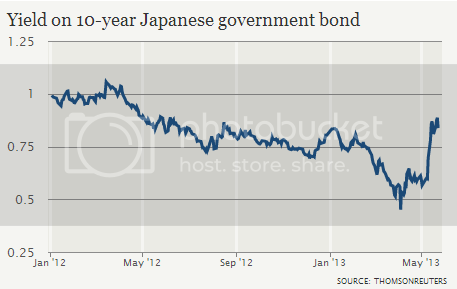 The market bought that argument over the alternative that JGB purchases by the BoJ would put a ceiling on yields. YOU HAVE TO wonder whether last Thursday was a turning point for global financial markets. Collapsing Japanese equities had a knock-on effect on Asian, European and US equities, while JGB yields spiked to their highest in a year and 10-year Treasuries pushed through 2%. Blame was placed on the vaguest of hints from Bernanke that QE3 was about to be tapered off as well as weak manufacturing data from China. But might it not have represented a moment of clarity among market players that something is really not quite right in the global economy? Are investors finally noticing that central banks have been forced to resort to desperate measures that represent the failure of ordinary monetary policy, and that fiscal policy in the US, Japan and Europe is no more about fine-tuning but how to confront mountains of debt that threaten to bring the whole house tumbling down? THE GREAT US economist JK Galbraith observed that "anything unsustainable cannot be sustained" and it seems that nowhere is that more apposite than when it comes to the Japanese government bond market. It might well have been that the JGB market could have kept chugging along at record-low yields as long as Japan's leaders were willing to accept low growth and deflation as the status quo. Indeed, the former BoJ governor Masaaki Shirakawa regarded Japan's deflation as structural, and based on the country's woeful demographic of an ageing and declining population. Now, Prime Minister Shinzo Abe's grand ambitions threaten to turn the spotlight on the unsustainable nature of the JGB market, which Bass has likened to a Ponzi scheme. The bankers in Tokyo tell me there is a widespread mindset of panic among institutional holders of JGBs and that can't be a good thing. Panic tends inevitably to lead to crisis, and goodness knows, after the eurozone crisis - which I refuse to believe has had a line drawn under it - global financial markets could hardly deal with another crisis without contagion on a massive scale. In order to stem panic-selling in JGBs, the BoJ will have to undertake a buying programme of a far greater size than initially envisaged and one that simply might not be viable given Japan's precarious fiscal position. I suspect the JGB market is about to take centre stage among the variables that dictate the actions of global financial market players, and that its role will be unequivocally that of the villain. Mr Abe might soon come to wish that he had kept Japan chugging along. His grand vision, for all its laudable intentions, seems likely to soon be revealed as fundamentally self-defeating. The N225 plunged a whopping 1,143 points (-7.32%), European stock markets slide after Nikkei plunged > 7%. FTSE 100 falls 120 points in early trading after Japan's Nikkei suffers its biggest daily fall in over two years, after disappointing Chinese economic data. Japanese policymakers might learn the hard way that one must be very careful about what you wish for. Having engaged in the most unorthodox monetary policy experiments to engender some inflation into the Japanese economy, they might find it difficult to get the inflation genie back into the bottle once the inflation process has been restarted. Indeed, as markets become increasingly alert to the very real risk of long-run monetary financing of Japan's highly compromised public finances, there might be no turning back on the road to high Japanese inflation. Since taking office last Christmas, Shinzo Abe, Japan's new prime minister, has vowed to do whatever it takes to extricate the Japanese economy from the chronic deflation from which it has long suffered. To that end, he has pledged to increase Japanese inflation to 2 percent within the next two years, and he has shaken up the leadership of the Bank of Japan to ensure that Japanese monetary policy is pursued in a manner consistent with that inflation goal. At the same time, despite the truly appalling state of Japan's public finances, Mr. Abe's government is engaging in a short-run Keynesian-style fiscal stimulus with the aim of reviving flagging consumer and investment demand. The centerpiece of Japan's efforts to revive inflation is the Bank of Japan's pledge to print money on a scale that makes similar efforts in the United States and the United Kingdom pale. Over the next two years, the Bank of Japan proposes to increase the size of its balance sheet by a staggering US $1.4 trillion. It will do so through the purchase of Japanese government bonds and other financial instruments at the rate of around US $70 billion a month. These purchases are expected to almost double the size of the Bank of Japan's balance sheet from 35 percent of GDP at present to over 60 percent of GDP by the end of 2014. As was to be expected, the prospect of massive Japanese money printing has sent the Japanese yen reeling. Over the past five months, the Japanese yen has lost as much as 25 percent of its value as measured against both the US dollar and the Euro. This large move in the yen has provoked charges by the Chinese government that Japan is engaging in a currency war that deliberately aims at cheapening its currency to boost its exports at the expense of its neighbors. However, at the recent IMF Spring Meetings, the move in the Japanese yen was accepted by Japan's main industrialized country partners as part of Japan's effort to boost inflation. This gives Japan the green light for further rounds of yen weakness. A real risk to Japan's unprecedented monetary policy experiment is that it is being conducted in the context of highly compromised public finances. A measure of how compromised are those finances is the fact that Japan's gross public debt now stands at 240 percent of GDP or around 2 ½ times the equivalent US ratio. Similarly disturbing is the fact that Japan's budget deficit, excluding interest payments, remains at around 7 percent of GDP. This makes it all too likely that Japan's public debt ratio will continue to deteriorate at a rapid rate. In the past, Japan has managed to finance its large budget deficits through a very high domestic savings rate. However, those days are long behind it as suggested by the sharp decline in recent years in Japanese household savings as its population rapidly ages. Among the industrialized countries Japan's population is now aging at the fastest pace. This holds out the prospect of a sustained further decline in the Japanese savings rate as an aging Japanese public runs down its savings to finance its retirement. A basic question that should be keeping Japanese policymakers awake at night is who will be buying the Japanese government bonds that will be needed both to finance Japan's large budget deficit and to roll over the very large amount of government debt that will be falling due over the next few years. In the context of extraordinarily low long-term government interest rates, a plummeting currency, and rising domestic inflation, one can hardly expect foreigners to step in to replace Japan's aging population as a major buyer of Japanese bonds. This raises the specter of the Bank of Japan being forced to continue buying enormous quantities of Japanese government bonds to prevent a rise in Japanese government borrowing rates that would only make the Japanese public finances even more unsustainable than they are at present. The dollar-yen, which is trading at multi-year highs has spent several weeks consolidating near the 95 level. The breakout above 95 has an upside target near 102. Speaking on CNBC`s "Asia Squawk Box" on December 21 as the dollar-yen moved above 84 we set the upside resistance target near 95. In notes at the end of February we set the upside target near 102. The resistance behavior near 95 is significant because in the future this provides a floor for any market retreat. The rise of the yen is dragging the Nikkei index after it. Watching the dollar-yen gives early warning of Nikkei behavior. This rapid rise from 79 to 95 had the short traders twitching their trigger fingers. They ended up shooting themselves in the foot. The rise was very rapid, but it was not unexpected from the technical chart perspective. The dollar-yen breakout above 79 in October 2012 was part of a long term fan reversal pattern. This pattern started with the peak price of 110 in August 2008. We have spent five years with the yen well below parity, but this is not the usual condition for the yen. A return to parity or above is the long term position of the yen from 1996 to 2008. Resistance near 95 is well established. It acted as a support level in March and August 2009. It acted as a resistance level in April 2010. This has been a major feature of the market post-Global Financial Crisis. Now that this has been broken this suggests it will become a strong support level in 2013. When it was acting as a resistance level it meant the dollar-yen took several weeks of consolidation near this resistance prior to developing a breakout. The current breakout has two upside targets. The first target is near 101. This was a major support level in December 1999 and again in November 2004. However, it offered no support in April 2008. This suggests that it will offer limited resistance for a breakout above 95. The most powerful support-resistance level is near 102. This acted as support in June 1997, January 1999 and again in September 2005. It acted as a resistance level in January 2004 and June 2008. It was the peak high used for the start of the long term fan trend reversal pattern in August 2008. Parity is a strong probability, but it`s only part of the story. When we step back and look at a monthly chart we see two features. First, as noted, is that the yen has spent a long time historically above parity. Second is that any breakout above 102 has an upside target near 111. It`s a long stretch to set this as a target, but any sustained breakout above 102 has 111 as the next target. This acted as resistance in 1994, 2000 and 2004. It acted as support in 1997, 1998 and 2006. 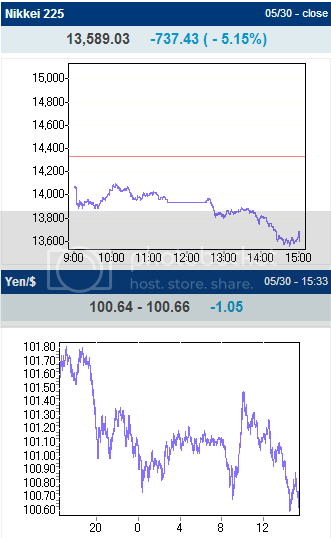 (Reuters) - A selloff in the yen paused on Tuesday as it neared 100 to the dollar, while a firm start to the U.S. corporate earnings season and a fall in Chinese inflation lifted share markets. The Japanese currency hit 99.67 to the dollar in Asian trading, the greenback's strongest level versus the yen since May 2009, before the selloff ran out of steam. The euro stopped at a peak last seen in January 2010 of 129.94 yen. The dollar has gained about 7 percent against the yen since the Bank of Japan (BOJ) unveiled a massive stimulus programme last Thursday involving large purchases of long term Japanese government bonds (JGBs). "Markets are increasingly focused on the notion that larger JGB purchases, at longer maturities, by the BOJ could push Japanese domestic long-term investors elsewhere," said Vassili Serebriakov, strategist at BNP Paribas. In early European trading the dollar was at 98.91 yen, down 0.4 percent, while the euro was down 0.25 percent on the day at 128.93 yen. The BOJ's bold measures are also having a major effect on the world's main bond markets by sending Japanese government yields down sharply and spurring a search for higher-yielding assets, sending yields lower on U.S. and euro zone debt. The yield on 10-year Treasury notes stood at 1.74 percent, little changed from late U.S. trade on Monday, although not far from a four-month low of 1.677 percent. German government 10-year bonds were steady at 1.24 percent having hit 1.2 percent on Friday, their lowest levels since mid-2012 when the European Central Bank promised to do whatever it took to save the euro. European equity markets rose in early trading, led by mining stocks as investors hoped for more accommodative monetary policy from China following benign inflation data, and after U.S. firm Alcoa posted solid earnings. The FTSE Eurofirst 300 index of top European shares was up 0.5 percent at 1,170.30 points. London's FTSE 100, Paris's CAC-40 and Frankfurt's DAX all opened as much as 0.7 percent higher. U.S. stock futures were also firmer, suggesting a firm Wall Street open. Earlier, the MSCI's broadest index of Asia-Pacific stocks outside Japan rose 1 percent, led by Australian shares which gained 1.4 percent on rises in blue chip financials and miners. China's annual consumer inflation cooled in March as food prices eased from nine-month highs and producer price deflation deepened, data showed on Tuesday, leaving policymakers room to keep monetary conditions easy and nurture a nascent recovery. Alcoa Inc, the largest U.S. aluminium producer, kicked off U.S. earnings on Monday, reporting an increase in quarterly profit and easing concerns about corporate results in the first three months of 2013. U.S. crude futures rose 0.2 percent to $93.54 a barrel and Brent rose 0.15 percent to $104.83. Crude oil prices have seen some support from tensions on the Korean peninsula after words from North Korean leader Kim Jong Un about the prospect for war with the south. (Reuters) - The Bank of Japan unleashed the world's most intense burst of monetary stimulus yesterday, promising to inject about US$1.4 trillion into the economy in less than two years, a radical gamble that sent the yen reeling and bond yields to record lows. New Governor Haruhiko Kuroda committed the BOJ to open-ended asset buying and said the monetary base would nearly double to 270 trillion yen by the end of 2014 in a shock therapy to end two decades of stagnation. In Tokyo a a smiling Kuroda noted: "This is an unprecedented degree of monetary easing. I'm confident that all necessary measures to achieve 2 percent inflation in two years were taken today," he said. One of those steps was to abandon interest rates as a target and become the only major central bank to primarily target the monetary base - the amount of cash it pumps out to the economy. The scope of the changes Kuroda pushed through, and the fact he secured unanimous board support for them, drove the yen down sharply, knocked the 10-year bond yield to a record low, and nudged Tokyo share prices just shy of a 4 year closing high. "The result is nothing short of regime change," HSBC Japan economist Izumi Devalier said. The scope of Kuroda's overhaul offered immediate comfort to Japanese markets, but contains major risks. It could leave the central bank heavily exposed to government debt and potentially huge losses if it failed to stoke inflation and investors lost faith in its efforts to revive the economy, and it could trigger a currency war as other Asian exporters seek to remain competitive with a weaker yen. The European Central Bank, meanwhile, held rates at a record low 0.75 percent, the highest level among the world's major central banks. But ECB president Mario Draghi said the authorities stood "ready to act" because there was no certainty that the euro zone economy would pick up. The Bank of England also voted yesterday to leave its main lending rate unchanged - at a record-low level of 0.50 percent. Asian stocks mixed on Friday, after the Bank of Japan's new governor announced unprecedented monetary easing to end two decades of economic stagnation. Japanese benchmark index, Nikkei 225 rose 199.10 points or 1.58% to close at 12,833.64. Hong Kong's Hang Seng index decreased 610.59 points, or 2.73% to end at 21,726.90. South Korea's Kospi index decreased 32.22 points, or 1.64% to end at 1,927.23. Singapore's Straits Times indexed declined 8.02 points, or to 0.24% close at 3,299.78.